Ismael Mohamed, 38, is feeding the goats at the East African Refugee Goat Project of Utah on Saturday, March 9. Mohamed, 38, of Kearns in Salt Lake County, comes out most weekends to help around the ranch, which is located on 2,200 acres west of the Salt Lake City airport, overlooking the Oquirrh Mountains. The ranch sits on land owned by Rio Tinto Kennecott Utah Copper, a mining company, which leases out the property to the project for a $1 a year. It’s a collaborative effort between the International Rescue Committee, a nonprofit that supports newly arrived refugees, and three east African refugees communities in the Salt Lake area — the Burundis, Somali Bantus and Somali Bajunis like Mohamed. “When I’m here, I feel like I am back home,” said Mohamed, who resettled in United States in 2005, after fleeing the violence and ongoing civil war in his native Somalia. Like any other ranch, the purpose is to produce meat, but for East African refugees like Mohamed, it’s much more than that. It brings elements of their culture to Salt Lake that can stay with them, and also creates an opportunity for their children to learn about — and appreciate — their heritage. One of the main duties of volunteers at the ranch is to help socialize kids (young goats). March is one of the busiest months at the ranch, as it’s the second of month of ‘kidding’ season, when female goats (does) give birth. 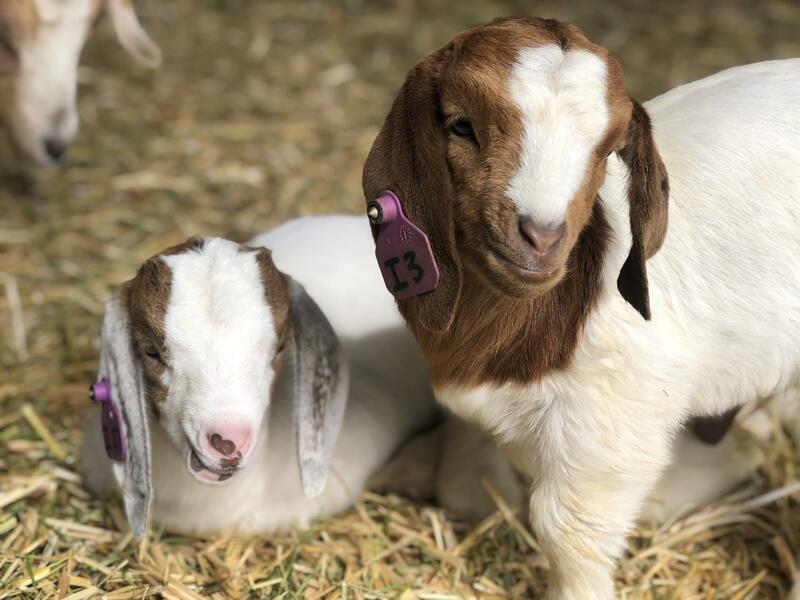 The project expects at least 100 newborn goats (kids) this season, said Kate Wright, the project’s coordinator. “We’ve been seeing some doubles, triplets and quads so we’ll see,” Wright said. The project has three staff members and one Americorps VISTA volunteer. Local refugees typically come out on the weekends to help around the farm, but because kids can be born at any time of day, Wright said the project also relies on volunteers to help watch out for does going into labor, and assist in the birth if necessary. 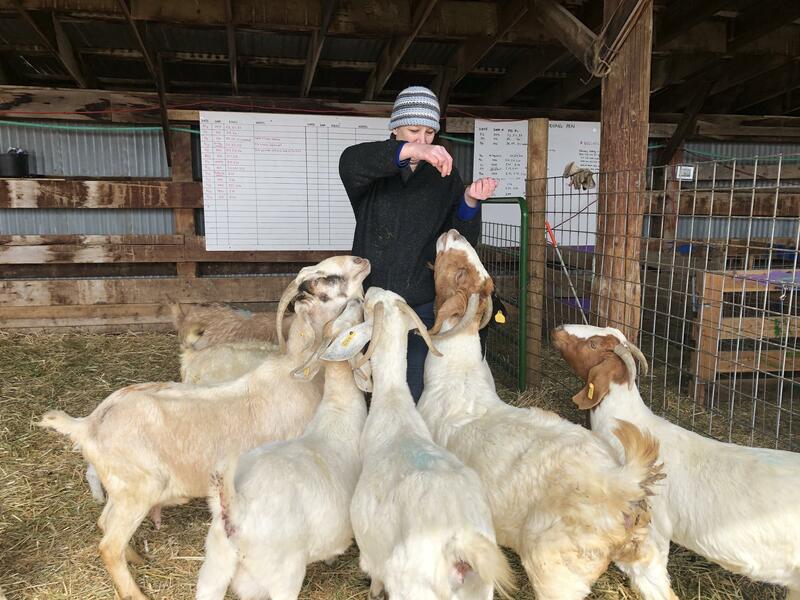 During a volunteer training earlier this month, 32 new volunteers laughed when they heard that part of their duties also including feeding animal crackers and red vines to the goats. They’re also called on to pick up and hold the babies to socialize them. Melissa Davis became a regular volunteer for the ranch in 2017 to work with baby goats, she said. She recalls watching dozens of videos on goat births on YouTube after attending a training day to prepare for her role. The preparation paid off that year when she was able to watch over a birth, she said. “It’s like any other birth — a very special moment to be a part of, and then fun to watch as the little kid grew throughout the season,” Davis said. Melissa Davis, a volunteer at the ranch, feeds a group of goats. The ranch was started in 2013 by local refugees and community partners like the IRC to provide halal goat meat for the refugees to purchase. Before the project, goat meat was found at few local stores. But Mohamed said he and others didn’t trust that it met their religious requirements. “If the process is done by non-Muslims then we cannot eat meat, because we do praying while we process the goat,” Mohamed said. It’s located in the middle of cattle ranches, approximately 15 minutes away from downtown Salt Lake City, making it easy for refugees to access the ranch, which is key, said Joshua Lloyd, the IRC’s acting deputy director. The ranch started with 45 does and one billy (a male goat), and now they are at about 400 goats, Lloyd said. There are also two llamas on property — Yolanda and Beatrice — that protect the herd from predators like coyotes or mountain lions. The project’s ultimate goal is to become self-sustainable. Right now it’s largely dependent on grants and donations, but Lloyd said that will slowly shift as they sell goats in larger numbers. They also expanding their business model by renting out their animals to landowners in need of vegetation management.